Whenever markets make unusually extended moves, the counter trend eventually arrives. The correction always has some cover story, or 'excuse', be it oil prices, debt issues in Europe or apprehension regarding the solvency of US municipal bonds. It can be unrest in the middle-east, or natural disasters like the recent tragedy hitting Japan, whatever the trigger may be, the technical picture is more often than not clear: a correction has been imminent and just waiting for the trigger for some time now. 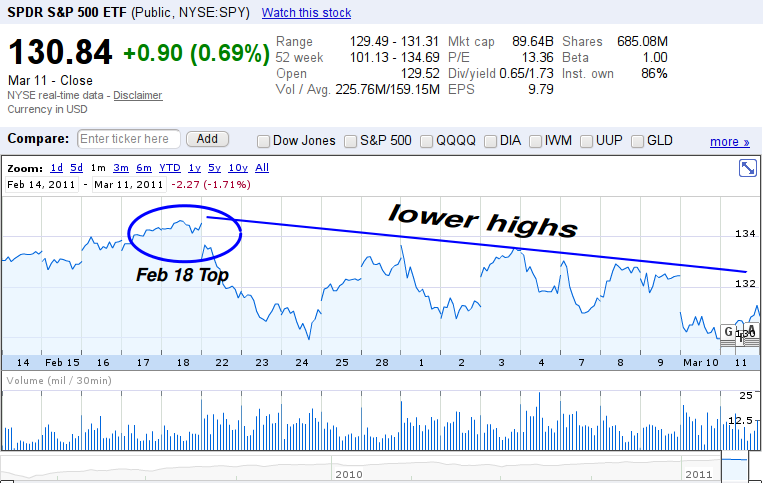 To anyone who has missed the intermediate-term top on almost 3 weeks ago, here's the 1-month SPY chart showing the mid-day top @ 134.69 on February 18. The chart is showing a series of lower highs since Feb 18, 14 trading days ago. There's been a lot of talk about a short-term bottom which makes me doubtful that we do indeed have one in place. Friday's small bouce, when taken in context, is clearly within the bounds of a normal consolidation in an established intermediate term down trend, as can be seen in the SPY chart above. 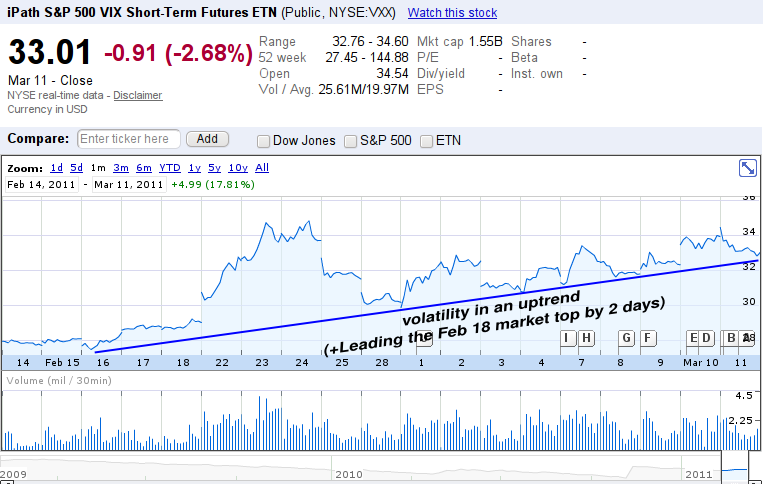 More telling are two other indicators: volatility and breadth which are normally leading the overall market. 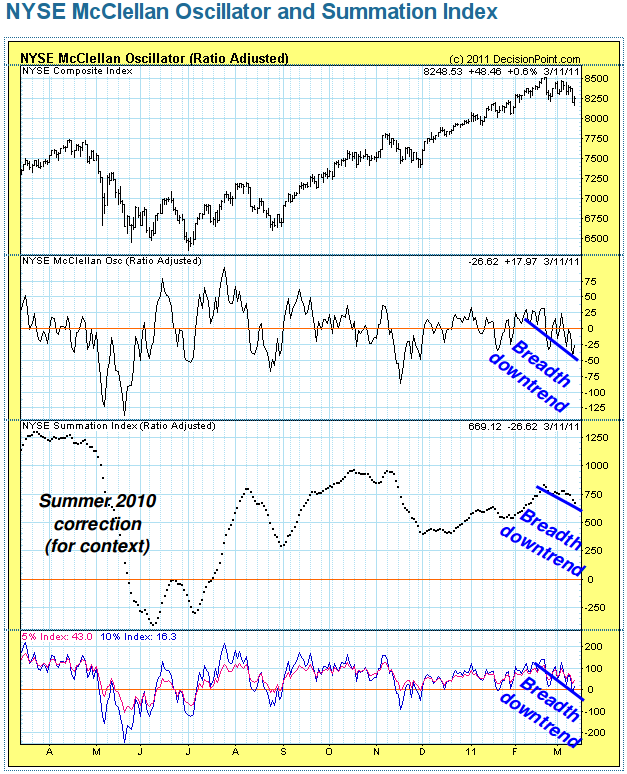 Last, but not least, here's a look at market breadth via the NYSE McClellan oscillator (NYMO). Note that this is a 1-year chart in which we can see the last meaningful (> 5%) bull market correction (April to August 2010) in the context of the current one. Not only we are nowhere near the magnitude of the 2010 correction, we are clearly in a downtrend in terms of market breadth telling me that chances are we haven't seen the bottom yet.